*****All appointments will be booked online. There is a 50% non refundable deposit due at the time of booking. The remaining balance is due at the time of service. If you book more than one service, you will be emailed an invoice to be paid upon receipt. Appointment will not be confirmed until the invoice has been paid. *Will travel for an additional fee of $5 within 10 miles of location from iMakeUpme LLC Beauty Bar. Additional fee of $.55 per mile thereafter. *Appointments should be cancelled 24 hours prior to your appointment time. *Late Fees: $15 (10-15 minutes) $25 (16-30 minutes) late after scheduled appointment time. Full price of service for no call/ no show clients. 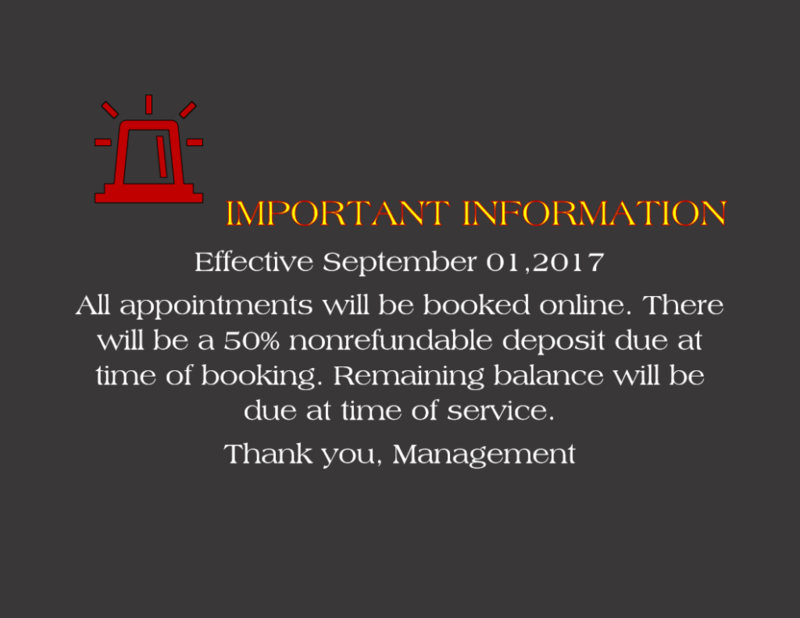 Appointments are automatically cancelled if you have not arrived within 30 minutes after your appointment time AND you will be asked to pay full price for service booked. *Abuse of failing to cancel or late arrivals will result in excessive fees and ultimately, unable to book indefinitely.